Please choose your canapés . Please choose your palate cleanser. The menu Tempting And Delicious! is unavailable at that date. Chef Nina Groves is unavailable on this date. 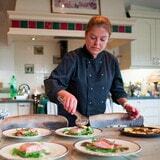 Check chef Nina Groves's calendar. Chef Nina Groves is unavailable in this city.